-25 kg It’s just a beginning. -25 kg. 40 days after the surgery;Still a year and a half to go to achieve ideal weight and major goal. But thus far the lost kilograms were enough to make him say: “Feels like I’m flying.” Giorgi Basilashvili uttered these words to me when planning a meeting at the Caraps Medline premises. Everybody knows him here, and supports, and especially Merab Kiladze and Otar Kepuladze – his consulting physicians. They, together with the patient, are passing through the path from 197 kilograms to the ideal weight which should be less than 100 kilos within a year and a half. The surgery to the 19-year-old guy was necessary but unattainable at that stage. 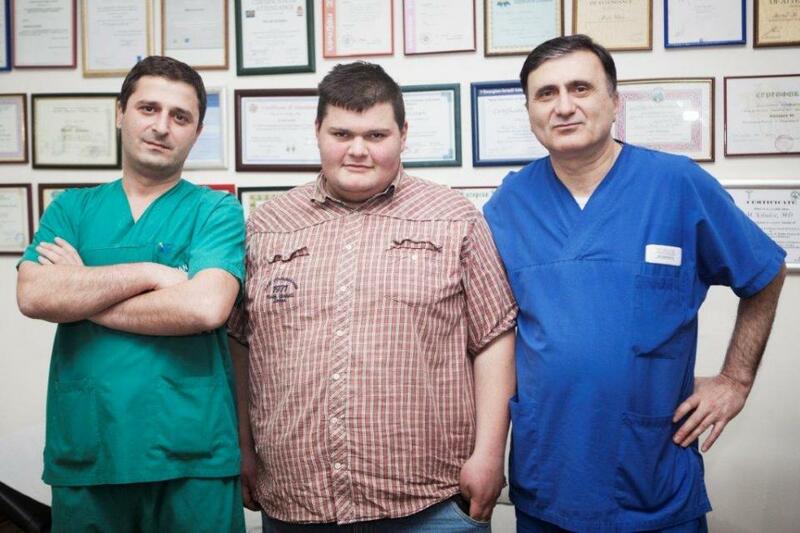 It was unthinkable to Giorgi that EVEX Medical Corporation would provide funding for the surgery; neither would he ever think about not being alone when going through this complex path and about people being around him to help tackle the problem. Giorgi weighed 197 kilograms. It’s quite a huge mass for a medium height guy aged 19. It’s a pathological obesity when the most vital bodily functions such as heart, lungs, genitourinary system, endocrine glands are disturbed. Giorgi’s weight caused pain in joints. Prior to the surgery the patient was so much eager to cross his legs and when being able to do so he very much rejoiced. A strict diet enabled him to lose 20 kilos but afterwards double weight came over. At his age the weight of this kind might trigger life-threatening complications. Thromboembolism, hemorrhage, stroke are quite likely to develop. That’s why the surgery was absolutely necessary. We asked Giorgi to lose 20kg, but instead of losing weight he gained 3 kg more. But for the rest he was ready to be operated on, therefore we did not put it off. 40 days have passed since the surgery and we are already having an amazing result in place. Losing a kilogram per week is considered as a good outcome, and Giorgi has lost a way more kilos. In Giorgi’s case vertical banded gastroplasty was employed. Stomach is a continuation of the esophagus, which is connected to the duodenum. Following this surgery patients tend to lose 90% of weight. We believe that Giorgi’s weight will go below 100 kilos, and he will maintain the weight we are going to have a year and a half later. From time to time we’ll be testing the level of minerals and vitamins in his body in order to rule out deficit origination. Giorgi’s mood plays a key role. Two weeks after the surgery he was to do some business and he easily walked up the 12th floor. His appetite has completely gone, three or four bites make him feel full. He can see the result, which is an additional motivation to him. He is now looking at girls. Giorgi follows our instructions, and complies with the regimen. He is thinking of handing over old clothes to the museum. He has got some plans and goals. He is intending to study montage and start a job at some TV company and all the aforementioned is preconditioned by his weight and that makes us enormously happy.